Tactile Turn Pencil - Quick Look! Will Hodges of Tactile Turn has become somewhat of a household name around the machined pen community. 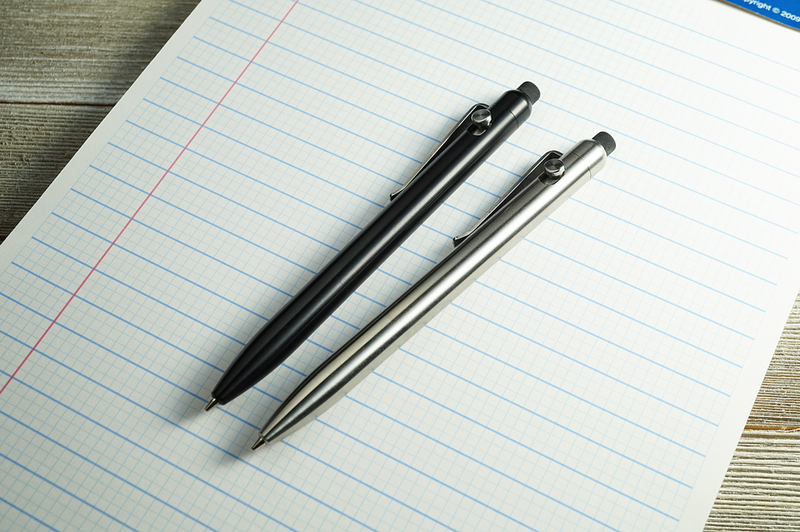 He's been at making metal pens and goods now approaching his 7th year (maybe longer...) and he did a quick Kickstarter campaign for a pencil version to match his Slider and Glider bolt-action pens. The reason I'm giving this pencil what I'm considering a "quick look" is since his Kickstarter was a short run and is ending on the 30th, but I still wanted to share some thoughts on it. 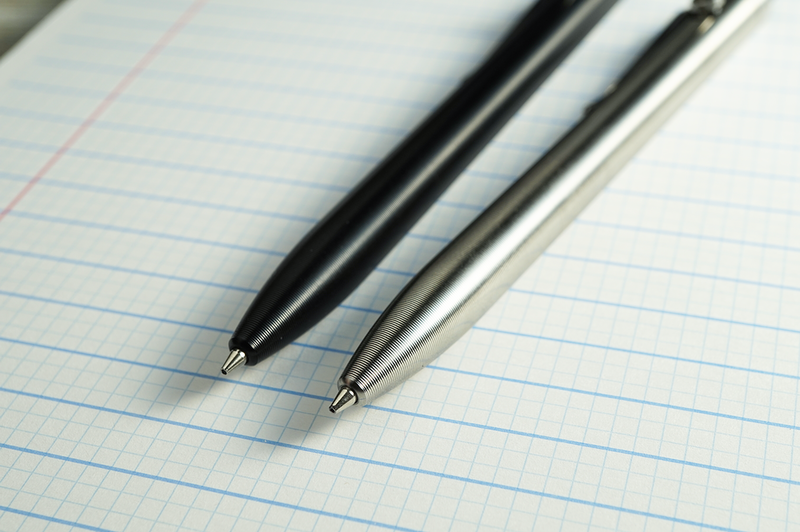 If you're familiar with his previous campaign for the Slider and Glider pens, the pencil takes the same shape and design and adds in a mechanical pencil feature. Where previously there was a curving bolt-action mechanism, the pencil replaces it with the same knob but now in a smaller, "clicker" motion. The internal mechanism Will chose to use is a Schmidt Feinminen-System which is a durable "over-the-counter" part that has been also used in a few other products over the last few years. It has a sturdy click and the main feature I like about it is that it actually screws into the grip section of the pencil. This makes sure there is little movement while writing, and also makes the part easily replaceable if something ever goes wrong (like dropping it...). Also a feature is that this would allow folks to swap mechanisms of various line widths in and out of the same pencil barrel if they so chose. Replacing the lead in the mechanism is a bit different than many pencils. Instead of popping out the eraser and dropping the lead into the barrel cavity, you have to unscrew the barrel sections, pull off the mechanism cap, drop in the new lead, and then reassemble the pencil. This isn't a super taxing exercise by any means, but the variation outside of the norm felt noteworthy. One final note about the mechanism is that the tip is non-retractable. This particular pencil tip doesn't have the usual lead pipe that protrudes out, but what is left exposed is the conical metal tip. Will sent me both 0.7 and 0.5mm versions of the pencil and I've found that the 0.5 is more prone to lead breakage (due to being thinner I'm sure) which may occur more so due to the lack of said pipe. The 0.7mm has been a champ with very little unexpected breakage while writing. If you dropped the pencil tip onto a hard surface it is definitely bound to get damaged. Also, if putting the pencil in a shirt pocket there may be some added wear that may occur from the tip poking at the fabric. The clip on the pencils match those of the Sliders and Gliders which are stiff sprung steel. These things aren't going anywhere. Will also sent me two versions to check out, a titanium and black anodized aluminum, and both look great. The barrels have the signature Tactile Turn "grooves" along the barrel which adds an interesting texture and grip across the whole pencil. From a comfort level while clicking to extend the lead, for me personally I'd probably give it a 6/10. This really is the only area that isn't the most comfortable part of the experience. The knob on the pencils are pretty short which requires you to click the top of it down with an area of your thumb that may not do a lot of clicking. It isn't a painful experience or anything, just takes some getting used to. I've found the aluminum to be a bit smoother than the titanium, but Will let me know that he's worked out how to polish up the inside of the titanium better to allow for less drag while clicking. The titanium (1.4 oz) certainly has slightly more noticeable heft, but only outweighs the aluminum by 0.4 oz which isn't much. If you were on the fence between the two due to weight, I'd say either one would satisfy. The erasers are replaceable, but not entirely sure how readily available they are from places like Amazon, but they'll be available if you ever need them from Tactile Turn. Lastly, I feel like the Kickstarter price point on these pencils is pretty great. The aluminum version can be had for $49 and the titanium for $69 which seems like a great value. If you love Will's other products, I'd say these are a great option to add to the collection. The Kickstarter is ending on the 30th, so check out the campaign if interested, and special thanks to Will for sending these over to check out.